Funny. I’m writing a post about fall decorating when it’s 90 degrees outside! Illinois is scheduled for a couple more days of sweltering heat and then our temps drop into the mid-70s by Labor Day. Since it can be pretty hot and humid even through the first part of October, it’s hard for me to get in the mood for fall decorating until closer to Halloween. I’m not ready for the warmer hues of autumn just yet, so I find ways to transition my home decor with neutral colors and natural objects. 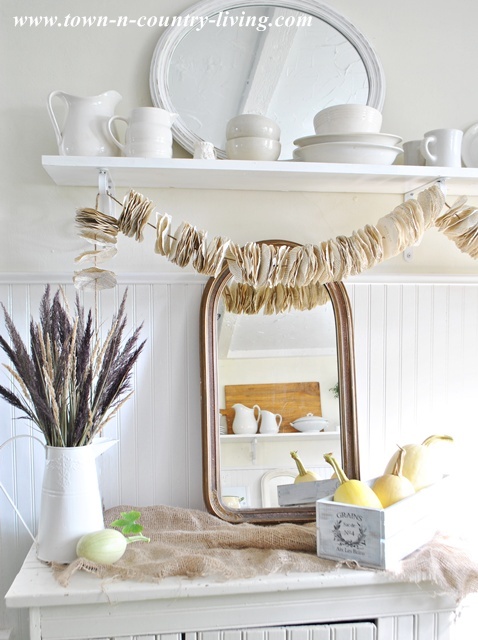 I grabbed a vintage mirror and book page garland to set the stage for a simple fall vignette in the kitchen. 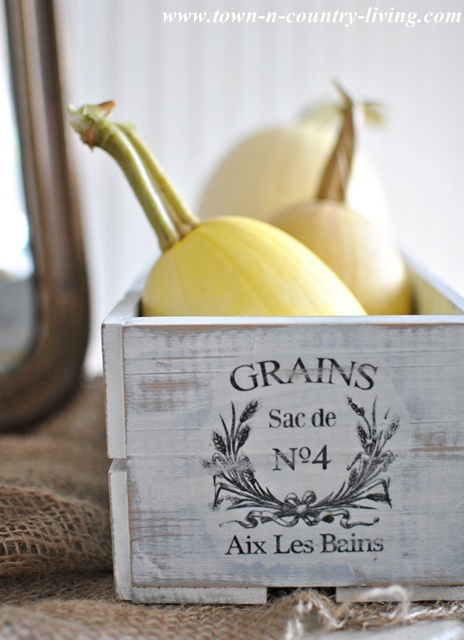 This French style crate is a favorite of mine. It used to be bare wood but I transformed it last year and it fits well with this fall decorating vignette. I applied the graphic at each end using the Mod Podge transfer method. The spaghetti squash is picked fresh today from my garden. I’ve never grown it before but made a recipe from this golden orb that I’ll be sharing soon. It’s quite the versatile vegetable. I enjoy using natural, organic elements in decorating. 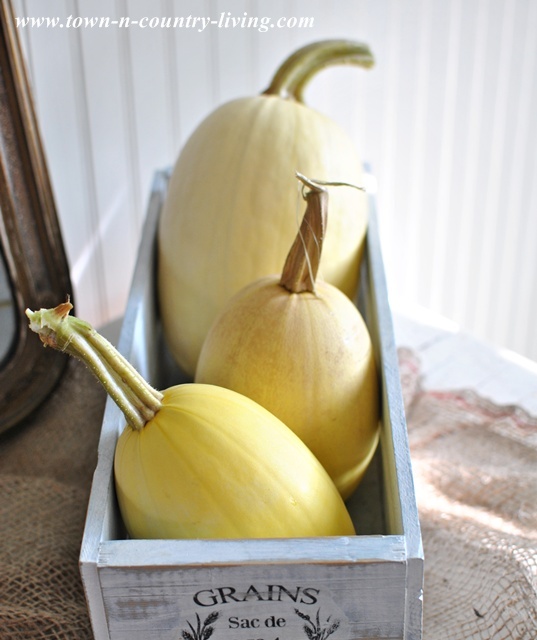 The spaghetti squash reminds me of the little white pumpkins you’ll soon be seeing at farmer’s markets. 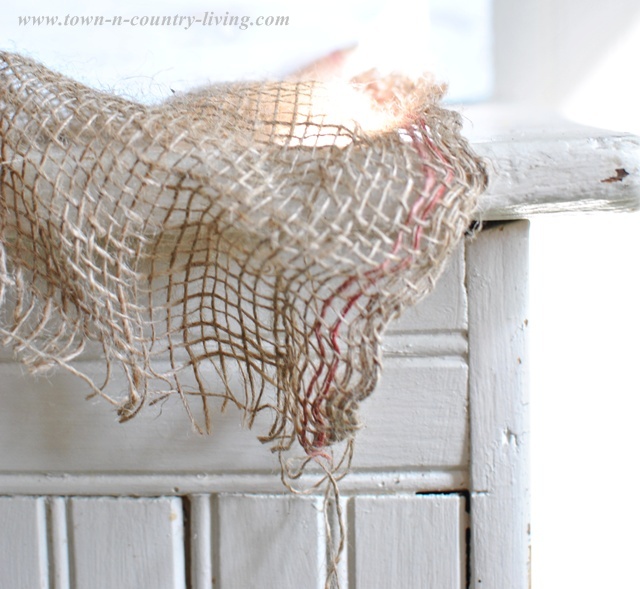 To add a little texture to my fall decorating vignette, I added a swatch of landscape burlap. I love using this stuff and recently made curtains for my family room out of it. It’s softer than regular burlap so it drapes better. 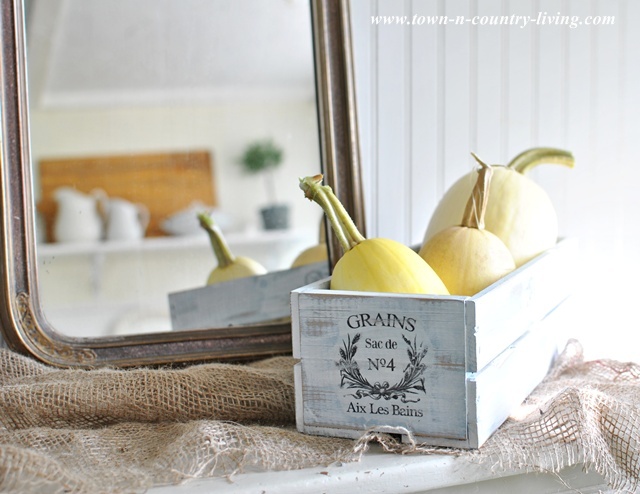 I think these natural and vintage items are perfect for early fall decorating. They’re not too heavy for summer and its lingering heat. Soon I’ll be sharing the book page garland tutorial. It’s so easy to make! Be sure to stop back the week of September 9th for Seasons of Home – Autumn Edition! I’m joining 6 other bloggers to share fall decorating inspiration with you. Each day one of us will share autumn home decor. 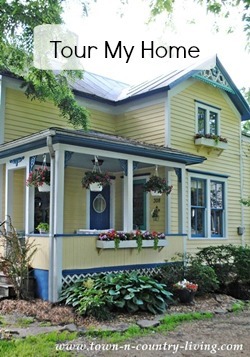 Learn more about the other bloggers and the schedule for the week in my recent Seasons of Home post. I’m with you, not ready for fall when it’s so hot outside! I really like your lighter tones and textures for this transitional time. I know what you mean about decorating for fall when the weather is so hot and humid! Ah, the life of a blogger. 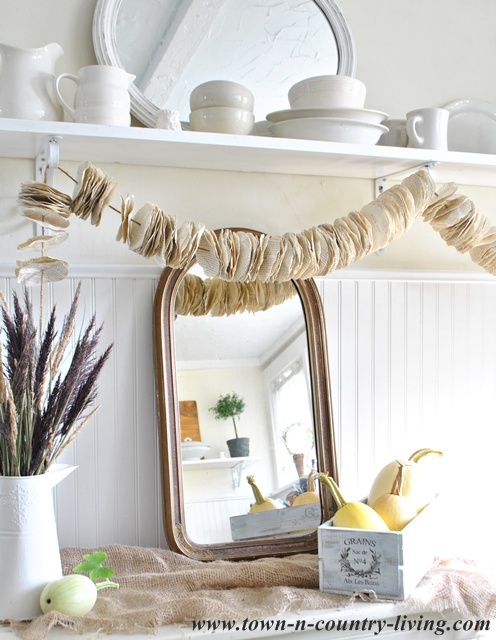 LOVE your organic fall vignette… especially the garland! 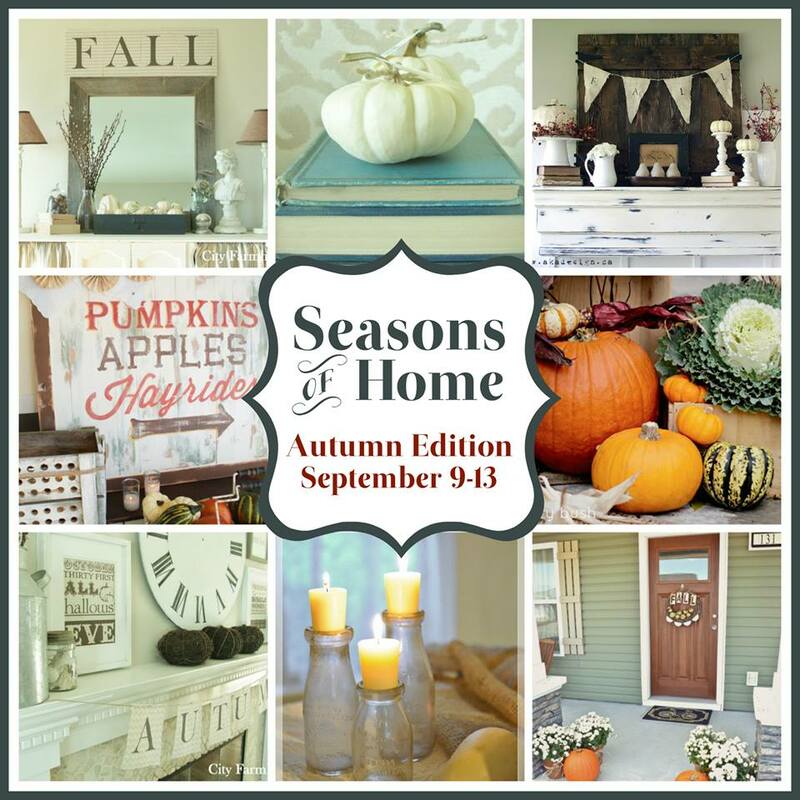 I’m really looking forward to seeing all the fall creativity at SEASONS OF HOME! This is a great neutral look for early fall. I like the pretty paper garland. Very pretty. Enjoy the weekend. So pretty! I love that book page garland! I need to find me some pumpkins! Can’t find any real ones up here! 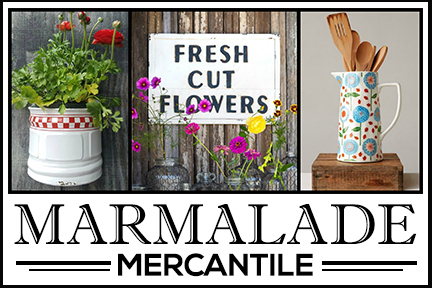 Hot again here too but I’ve been slowly putting stuff out and making some new items – well when time allows. Once the kiddos are back to school, I’ll be crafting like a mad woman for fall! 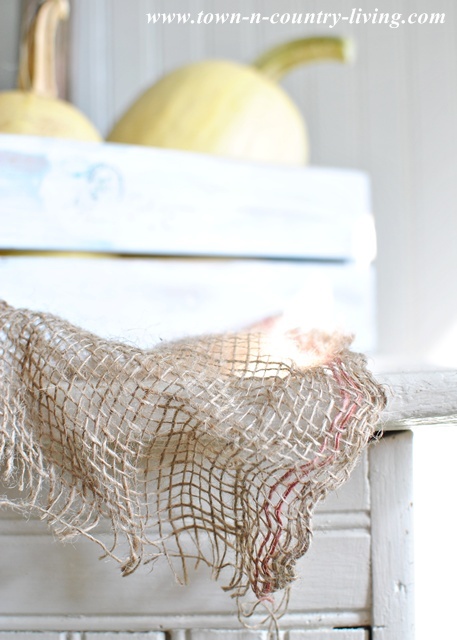 I love all kinds of squash and your fall decor has me craving some now. So pretty! This is so pretty. I love the neutral color scheme. 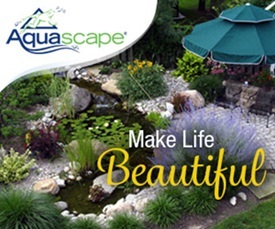 Thanks for sharing your this inspiring vignette! I’m the same way, Jennifer. I find it hard to think about Fall decorating when the temps are in the 80’s! We will hit almost 90 today and with the heat and humidity I’m not thinking pumpkins and Fall leaves. : ) I did make a Fall decorative piece for our outside table and have a couple more projects that will be for outside. I’m sure my neighbors will think I’m nuts! I like how you are transitioning it in and by the time Fall fully arrives you’ll be all set if you add a little bit in at a time. Beautiful!! I love the uses of the squash! Oh, your mantle is just gorgeous and fresh looking (I really did think those squash were white pumpkins!!!). Down under, in Aussie, we’re coming into Spring, well actually we’ve been there for most of winter really, we don’t get a real winter here! I’m enjoying traipsing through the garden centres and seeing what flowering plants I’ll buy! I’m not near ready for any fall decorating yet either. I hate to rush the seasons. It’s not fall for 3 more weeks! I’m trying to hang on to as much summer as possible…because I know what’s coming all too soon (*shudder*). What you’ve done looks fantastic though…not too fall-ish; more of a slow incorporation! So beautiful! I’m so jealous of the gorgeous spaghetti squash from your garden. I planted some this year and we had so much rain, no fruit ever set. Will try again next year. Yours are so beautiful in your French style crate. It is hot here in Utah too…in the 90″s for days! 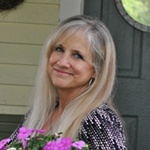 Please come link up to Centerpiece Wednesday on my blog and share this post with us. I saw this on Dwellinggawker and came over to see more. What a stunning post. It’s been a treat to stop by! How did you get the shabby edges on the garland?